My name is Siddhi Venkatraman and I'm a rising senior at Langley High School, Mclean, Virginia. My main topics of interest right now are mathematics, computer science, business, and economics. At this point, I don't really have an idea about what I want to pursue as my career path, so I'm keeping my options open. My favorite hobbies are playing the violin and basketball, as I've actively been involved in both for many years. 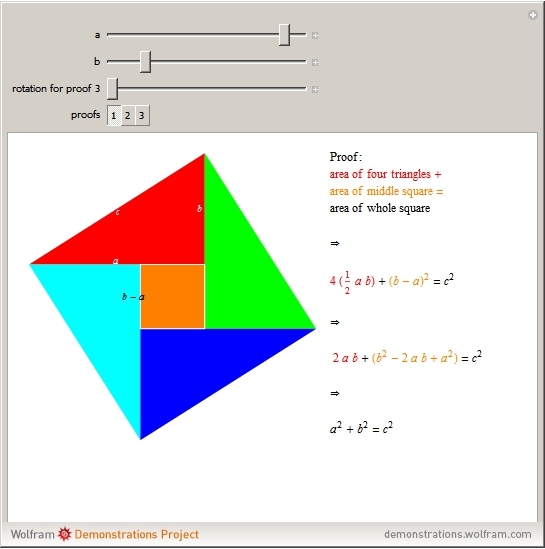 This Demonstration shows three different proofs of the Pythagorean theorem using four congruent triangles.